The Shackle Stick is almost ready to release. 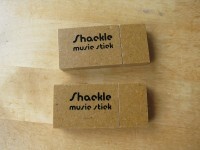 Shackle will be releasing a designer music stick at the beginning of August. It will contain music, video and secret treats. Next Next post: The Shackle Sticks are out the door.